The Glenn Beck Review: Is Beck encouraging his viewers to stay home on election day? On his Fox show on August 16th, 2010 Glenn Beck described a "perfect storm" about to hit the United States. He claimed that there is only one answer to deal with it, and voting for either party in November would not help. Beck's answer: God. So the Tea Party and the 9-12ers should stay home on election day and pray. The Middle East. Beck pointed to a map of the Middle East and declared, "America is still hated by all of these people." If Beck actually had a post-secondary education, he'd know that absolutes like "all" should always be avoided in descriptions. All the people of the Middle East do not hate America, but there are enough that it concerns this Administration along with the previous one. Maybe that's why they are sending moderate iman Feisal Abdul Rauf to the Middle East to promote America's ideals of religious tolerance. Since when is strife in the Middle East anything special? Economy. Beck declared that "this Administration is giving money to failing banks." 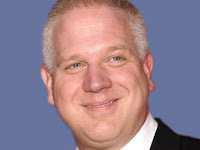 He must believe that his listeners cannot hear a lie when it comes out of Beck's mouth. It was President Bush who signed the TARP into law, and it was written by his Treasury Secretary, Henry Paulson. Beck also asked "why aren't people doing well? Why? Because we've abandoned the whole [one of those absolute words] concept of the free market system." We have? This is yet another example of Beck making an utterly absurd statement that might make sense to people who don't have any idea how the American economy works. It's a market system, Mr. Beck. Grocery stores, furniture stores, etc. are functioning in a market place. He also argued that people on unemployment should go out and take any job. That unemployment insurance keeps people in their homes when a minimum wage job would not is lost on Beck. Civil unrest. Beck is certain that the unrest in Greece earlier this summer is coming to the United States. No evidence was offered to support that idea. Our borders. Beck asked if anyone had noticed the escalation of violence on our border. By that he meant the drug violence in Mexico. Crime involving illegal aliens on the American side of the border has decreased in recent years, a fact too inconvenient for Beck to mention. He pointed out that an AZ sheriff is pulling back from the border patrols. Beck suggested that we should pull back to Portland, OR, but he omitted that fact that AZ is sending more national guard troops and the President just signed a bill to pay for "1,500 new border agents, additional unmanned surveillance drones and new Border Patrol stations along the southwest border." These inconvenient facts make Beck's rhetoric deceitful (again) and absurd. Are his viewers this uninformed to not notice this? They're buying bus tickets for his rally, so apparently they either are ignorant or indifferent to reality, other than the unreal world of Beck's narrative. US. By that Beck referred to people who hate capitalism and our Constitution. Would that include those willing to ignore the 1st Amendment and stop the Islamic cultural center from being built in lower Manhattan? Beck didn't give any examples of people who hate our Constitution, but the red meat was gobbled up across the nation. Energy. He pointed out that if the Middle East becomes more unstable, our economy collapses. Of course, he's opposed to government spending on research and development of alternative, green sources of energy that would make us less vulnerable to possible disruptions of the oil supply. The rest of the crazy stuff. Beck could have easily included his bizarre claims in this part, but did not say what the "crazy stuff" was. Beck then asked what the answer to this coming storm was. The President? Voting for Democrats or Republicans in November? Voting for Tea Party candidates on election day? No. Beck said that there is only one answer: God. Agreed! Beck's supporters should take his advice and stay home to pray that the United States will survive this "perfect storm," even if he made it up! Wow...that video is a perfect representation of the non-stop, ugly, misrepresentations on his FB page tonight...talk about "stoking the anger"... You can't possibly believe these folks will "quiet down" after the MidTerms?